DIG DEEP. SHOW UP. SHOW OUT. SUMMER CAMP REGISTRATION IS NOW LIVE!!!! CLICK BELOW TO SAVE $50 UNTIL APRIL 30TH. Jonny and Alexandra would like to thank all of you that believe in Bridgewater Performance and supporting us ON OUR journey. We are now officially open and couldn't be more proud of the product we have to offer. We cannot wait to help all of Wisconsin's Athletes improve their craft as well as help any person achieve their fitness dream. Please check out our class schedule and come see what we're all about. If you have any questions we are available 8a-8p. Something we live by at Bridgewater Performance. It’s a mindset, it’s the realization that the only person stopping you from greatness is yourself. Dig deep, look in the mirror and SHOW UP and SHOW OUT. It’s not something that can be taught, however, it’s something that is required to enter the gates of Bridgewater Performance. Jonny is a licensed Sports Performance Specialist and Sports Nutritionist who educates his athletes from all walks of life to achieve weight loss goals, add lean muscle or achieve overall health. 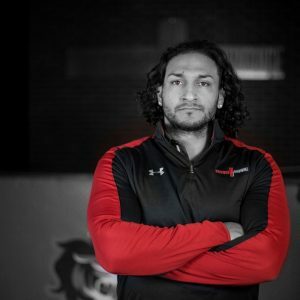 He specializes in helping athletes take their peak performance to the next level, working with some of Southeastern Wisconsin’s top high school, middle school and grade school youth. His lifelong exposure to high-level sports and athletics gives Jonny the unique understanding of each athlete’s challenges and goals. He demonstrates a positive attitude, preaching the bigger picture not only creating the best athletes, his goal is to make everyone an even better person. © 2019 Bridgewater Performance l All Rights Reserved.